Vietnam Veteran and Board Member, John Abbey, atttended the rededication of the Vietnam Memorial Wall on Veterans Day, November 11, 2012. John was honored to be chosen to read some of the names of the lost. It was a common question we hear each time we make a presentation. As most of you know, for the past 12 years Renee and I have been involved with a humanitarian group called the DOVE Fund — Development of Vietnam Endeavors. It was founded by a coalition of Toledo area Vietnam veterans and Rotarians. Our goal is to make a difference in the lives of the children and people of the land we fought in. We have built more than 40 schools, eight medical centers and numerous water purification plants; dug hundreds of fresh water wells, and created micro-finance and sanitation projects among others. One of those others is our Bandage Brigade that deals with the plight of the poverty-stricken, ostracized people of Vietnam’s leper colonies. These suffering souls live mostly in the cold mountain regions of Vietnam and are banished from the rest of the population. Their only care comes from nearby Catholic nuns who do what they can to help meet their needs. We began our attempts to help by stringing together a worldwide brigade of volunteers who knit and crochet clean, fresh bandages with which to wrap their open sores. Then, once a year, volunteers mail their bandages to our brigade leader who packages them to be delivered by our DOVE delegation. To date we’ve sent more than 12,000 bandages to these lepers; in January we’ll send more. Unfortunately, dealing with dreaded leprosy is only one of the issues they face. #During our last trip, we discovered that these people were starving. We were humbled when after providing them bags of dried fish that neither you nor I would even allow in our homes, they would bow so emotionally you’d have thought we had given them a bag of gold instead. So our DOVE Fund is trying to help feed them. Accordingly, Renee and I have been raising funds and have partnered with fellow Vietnam veteran Gary Vancena, and Monroe Post 1138, Veterans of Foreign Wars to hold a fundraising event for this purpose. “Tom & Gary’s Holiday Charity Bash, Part II” will be held from 5 pm to midnight Dec. 22 at VFW Post 1138, 400 Jones Ave. Entertainment will be provided by my band, Tom Treece & Cross Point, along with Gary’s alter-ego, Daddy G. Knight, as well as appearances by special guest stars. Tickets are $10 and available at the VFW or by calling Renee at 777-0850. If you would like to make a donation, make your check to “DOVE Fund” with “Feed the Lepers” on the memo line and mail it to Tom Treece at 546 Kaye Lani Ave., Monroe 48161. How strange it seems to obviously more than just me that in our age of medical advancements, leprosy is still a threat to humans in our world. And yet, perhaps sadder still is the fact that they must struggle so just to find something to eat! At first glance, the group of women sitting in the coffee bar of the Barnes &amp; Noble at Bandera and 1604 were another manifestation of the Information Age. Sitting in a cluster and talking, each was too busy with something in their hands to even look at each other as they spoke. They weren't, however, updating their Facebook status, sharing a picture of their coffee on Instagram or texting another person far away. Quite the opposite. 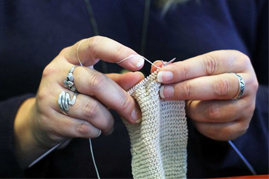 The six women, looking up occasionally to sip their coffee, were doing something completely selfless - knitting (or crocheting) cotton bandages for patients in Vietnamese leprosy colonies. In a time when people are focused on themselves, grand gestures and making sure that everyone knows about them, the women of the San Antonio Bandage Brigade were spending yet another Saturday morning toiling away in anonymity, doing something relatively mundane, for people they don't know and who will never know them. Everything about this blew my mind. I thought leprosy was a thing of the past, like the Black Plague in medieval Europe. I was wrong. While leprosy has been beaten by medicine in the developed nations, it's still a problem in the undeveloped world, according to the D.O.V.E. (Development of Vietnam Endeavors) Fund, a Toledo-based charity that organizes relief efforts for that impoverished nation. The World Health Organization reported 244,796 new cases of the ancient bacterial infection, also known as Hansen's disease, worldwide in 2009. You can thank bad sanitation and a lack of medicine for leprosy's resilience. Nor was I aware of the San Antonio Bandage Brigade, women who are among thousands of volunteers nationally working - alone, in groups, or both - on bandages. These specialized bandages are made with mercerized cotton yarn, which doesn't shrink and is resistant to mildew. Bandages require plain-jane, naturally colored cotton. Dyed cotton can't be used because it can irritate leprosy wounds. Like all knitting projects, bandage making is painstakingly slow work. It takes 20 hours to crank out a single-inch by-foot long bandage. "There are machines that can literally knock these out in a few minutes," says Lizzie Smiley, who founded the local group in May 2011. "But that defeats the purpose. This is a labor of love." I like that. Lots of us do charitable acts, but very few of us go about it selflessly. We tell our friends, or take pictures, or drop our acts of kindness into conversations or post them online. I'm not impressed when you spend thousands of dollars to make an overseas trip and come back with hundreds of photos of your charity work. But I am humbled to be in the presence of a person who hands a cheeseburger and a coffee to a homeless guy under a bridge on his way to work or to the store. The Bandage Brigade is like the cheeseburger person. Smiley heard about the program from an aunt who was involved with a Chicago group. "I was captivated by the idea," she says. "I loved how humbling it was." She started talking about it with friends in her weekly knitting group, such as Amanda Bayless and Betsy Grimm. As sewing junkies (I like the metaphor because they can't quit it and it involves needles) they jumped at the chance to help. They don't make a big deal out of this. They talk about it in front of others and, slowly but steadily, the gig sells itself. They don't put a sign up while they're knitting or even a tip jar in the middle of the table. There's no Facebook group, but rather a Meetup.com group. You have to be looking for them to find them. It's a small group, but on the day I was with them, two relatively new members had just climbed on board. One was a sewing rookie. She wanted to help lepers and herself, since knitting bandages is an easy introduction to the skills necessary to do the harder stuff. The knitters like each other. They have fun. They learn how to knit faster. But for the San Antonio Bandage Brigade, the payback is unspoken and can't be quantified. They'll never know who they helped. The lepers will never know who helped them. And that's with the women who meet monthly at Barnes &amp; Noble. "It's not just 'Let me help you,' " Smiley says. "It's 'Someone loves you. Someone cares.' "
But for many veterans like Taylor, Vietnam had remained a big part of his life. His thoughts turned from trying to forget Vietnam and thinking that maybe he could someday return and do something for the people of a country that had been torn by decades of war. In March, Jim Taylor was selected among four of over seventy local humanitarians to receive the prestigious Jefferson Award. He was also selected to represent the Toledo area at the National ceremony held in June in Washington DC. The Jefferson Award is a national recognition system designed to honor individuals who demonstrate extraordinary service to their community and the world. Its mission is to recognize, inspire and activate volunteerism and public service to communities, schools and the workplace. This is not the first time a DOVE Fund trustee has been honored with the Jefferson Award. Two years ago, Fred Grimm, current Vice Chair for Vietnam Projects, also received the Jefferson Award by the Toledo organization for his service to the community. 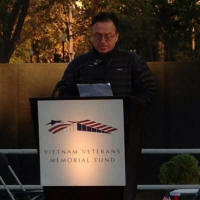 Grimm, also a Vietnam veteran and Purple Heart recipient is currently planning his thirteenth visit to Vietnam in January of 2013. Although Taylor, 66, is now retired, he never has time to relax. He is a lifetime member of the Toledo Old Newsboys and volunteers at his church gathering food to feed the needy at its Hospitality Kitchen. We are so fortunate and proud to have Jim as part of the D.O.V.E. Fund. Honorary Board member, Dianne Van Voorhis, gave a brief talk about the D.O.V.E. Fund at a non-profit organization she belongs to in Los Gatos, CA. A frequent traveler to Southeast Asia since 1994, Van Voorhis has more than a passing interest in Vietnam. As a teenager, she watched friends march off to the controversial war and became fascinated with its lingering impact on America's social and political life. In 2001, after teaming up with Vietnam veteran and D.O.VE. Fund Honorary Board member, Dodie Gaines, Van Voorhis joined the D.O.V.E. Fund and built Ha La Nursery School in Quang Tri province and later teamed up with with Jill and Fred Grimm to build another school in Quang Ngai province near Central Vietnam. After a short introduction, Van Voorhis presented images of Vietnam, highlighting the great work of the D.O.V.E. Fund. 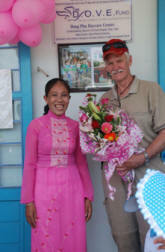 Her audience of 50 ladies, some of whom have visited Vietnam and have supported D.O.V.E. in the past, were interested in many facets of what we do. Van Voorhis explained that after the war ended in 1975, Vietnam went through an economic struggle from which it is just now emerging. She talked about the areas in which D.O.V.E. focuses: education and scholarships, working with the blind, microfinance, medical centers, water and sanitation, and our latest endeavor of providing solar units to needy families. She also talked about D.O.V.E.’s collaboration with the Bandage Brigade and the recent dental outreach which was partially funded by the D.O.V.E. Fund. The audience was entertained by the many photos of the projects, and especially the pictures of the adorable children. The D.O.V.E. Fund (Development of Vietnam Endeavors) held its annual Charity Dinner Auction at the Pinnacle Banquet Center in Maumee on August 17th. Before enjoying a wonderful sit down dinner, more than 180 people enjoyed cocktails while browsing through over 100 silent auction items ranging from fine silks, furniture and jewelry from Vietnam to sports memorabilia and golf outing packages at some of the areas favorite golf clubs. Vietnam veteran and D.O.V.E. Chairman, John Craven, spoke about the organizations commitment the help the poor and needy in Vietnam while highlighting the wide range of projects undertaken since the founding of the D.O.V.E. Fund in 2000. Fred Grimm, Vice Chair of Vietnam Projects, told of the new P.E.T. (personal energy transportation) project that will give greater mobility to amputees and also noted the expansion of the solar lights project which will provide low cost lighting for students in rural areas of Vietnam. Vietnam veteran and emcee, Tim Kearney, presided over the evening and thanked everyone for helping the D.O.V.E. Fund mission while acknowledging the great contributions of past trustees. He then introduced WTOL TV personalities Jerry Anderson and Chrys Peterson who led the enthusiastic crowd during the live auction. Generous bidders had their pick among Fishing trips, beach vacations and college football game packages. Many thanks go to Auction Chair, Julie Oswald-Abbey, who was ably assisted by Trustees Jill Grimm and Marian Grems along with dozens of volunteers. While the final tally is not yet complete, early estimates indicate that the event grossed more than $68,000. More than $26,000 was raised for the scholarship fund which will provide educational assistance for many poor but deserving students in Vietnam. Another beautiful day awaited golfers who assembled at the South Toledo Golf Club for the 12th Annual D.O.V.E. Fund Golf Outing. Proceeds from the fundraising event will be directed to the many humanitarian projects funded by the Toledo based charitable organization that benefits the neediest people of Vietnam. D.O.V.E. Fund trustee and proprietor of the South Toledo Golf Club, Greg Fish, called the group to order at 11:30 and directed each foursome to their respective tees. At the end of the day, all the participants gathered together and traded stories over the cash bar and listened to the music of singer, guitarist and long time D.O.V.E. Fund member, Tom Treece. Afterwards, an outdoor dinner of prime rib, baked potato and chocolate brownies were served to all the guests. Anchored by the renowned golf architect and Toledo resident, Arthur Hills, the winning team, captained by D.O.V.E. Fund founding member, Fred Grimm, and assisted by Mike Casey and Tom Tillander shot 14 under par for a winning score of 57. Golf clubs, bags and shirts along with dozens of golf balls were won by lucky raffle ticket holders. Grimm, Hills and his team are anxious to defend their title in 2013.